Don't compromise every time you advertise! SourceOne Slant-Back Sign Holder is the ideal frame for your personal and professional brochures, promos, and pictures. This 3.5 x 2.5 inch sign holder is self-standing due to its reinforced solid-back base. There is an insertion slot on its side for papers bearing signs, text, and pictures. The frame can be propped up vertically or horizontally, so you can display images however you like without hassle. Made of high-grade acrylic, this transparent sign holder boasts top-notch quality, as evidenced by its exceptional durability. Acrylic is a shatter-resistant material that is lightweight but strong. It won't break even if it falls to the ground, making it ideal for high surfaces. The frame has smooth edges and is transparent, and it protects signs and pictures from dirt and dust so that text stays readable and images remain visually appealing. This sign holder serves a lot of purposes and can be displayed in many different places. It can be used to show restaurant bestsellers and brochures, package deals in hotels, new features in a reception area, and new regulations in schools. It can also be used to prop up personal pictures in homes. SourceOne items are always in stock. We offer a money-back guarantee, and we promise fast shipping. Your order will arrive fast and in good condition. Customers are our number-one priority because if you're satisfied, it means we've done our job properly. Never settle for less and use only the best with SourceOne Slant-Back Sign Holder. SELF-STANDING. 3 1/2 Inch by 2 1/2 Inch Frame. 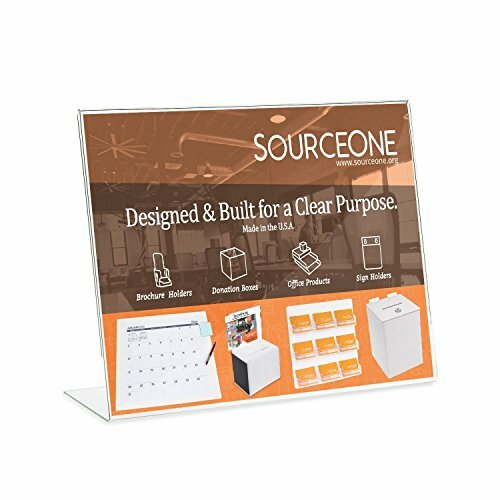 Self-standing and innovatively designed, the SourceOne Slant-Back Acrylic Sign Holder is the ideal frame for images, brochures, and advertising pamphlets. It displays pictures and posters efficiently, and stands on its own without difficulty thanks to its solid-back base. It can be displayed vertically or horizontally, as you prefer. DIFFERENT TYPES. This package contains one pieces of 3.5 x 2.5 inch slant-back sign holders. Each sign holder has an opening on its side for easy paper insertion. Standard-sized paper works best. Landscape styles are also available for horizontal posters and pictures. AZM 10 Pack Clear Acrylic Business Card Sign Holder Slant Back Display 4"x2"